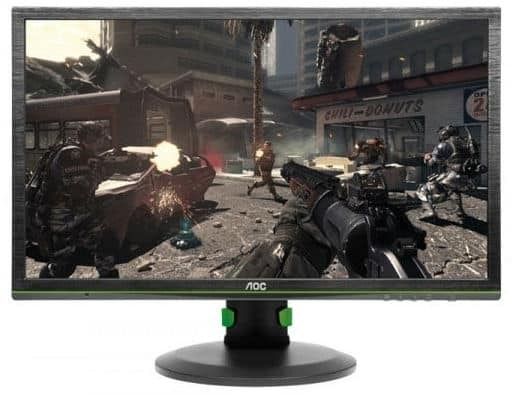 The AOC G2460PG is a cheap gaming monitor that is manufactured for an ‘Ultimate gaming experience’. Let’s have a look at the technical specifications, added features and the Pros and Cons to determine how much this display has to offer. The AOC G2460PG is a monitor designed with keeping in mind the buyer perspective about Frills and utility. This 24-inch W-LED monitor is armed with the Nvidia G-Sync module and a TN Panel capable of a Refresh rate of 144Hz. This is a feature that is a boon for the FPS gamers. The native resolution is set at 1920×1080 Pixels. The response time offered is 1 ms Black to Black. These two factors when combined, offer high-speed gaming without any problems like Input Lags and stutter. The TN Panel, on the other hand, is a problematic factor in this case as when compared to IPS/VA Panels that are gaining popularity fast and have pretty much taken over due to their superior viewing angles and performance. The brightness of the monitor is a standard 350 cd/m2. The AOC G2460PG offers a contrast level of 798:1 and 16.7 Million True life HD colors. Despite the Panel being a TN-design, the color coverage is superb and way above the average panels, at around 98.2%. The TN panel used in the AOC G2460PG is housed in a matte-black cabinet that is about 2 inches in thickness. The display’s stand is one of the most practical and useful ones out there, supporting height, tilt and swivel adjustability. The monitor offers to view angles of 170° Horizontal and 160° Vertical. This is a monitor that offers a better viewing angle and support than most TN Panels – however, there is a drop in image quality when viewing the screen from around 50° angle. The 90 degree pivoting for Portrait-mode viewing is also enabled in the AOC G2460PG. These tools provide maximum viewing comfort. The front layer on the screen is anti-glare and reduces eye fatigue during those long sittings. There is one USB 3.0 upstream port on the right side of the display. Next to it are 2 USB 2.0 ports. The upper one is red in color, and it features fast-charging capability for devices like a Phone, Tablet, etc. There is no audio jack input, and there is one Display port on the monitor for Video input, the corresponding cable to which, is included in the box. The AOC G2460PG comes with a 3-year warranty. The AOC G2460PG features the NVIDIA G-Sync variable Refresh rate technology. This is a very useful tool in eliminating stuttering and tearing during gaming and multimedia applications. The other highlighted features improving the motion gaming experience include the ULMB (Ultra Low Motion Blur) that improves the overall motion clarity by a huge amount and the NVIDIA 3D Vision 2 that enables the monitor to give you a true, high-definition 3D viewing experience. All-in-all, the motion gaming is made as awesome as one can get on a 24-inch TN screen! This monitor comes with a very user-friendly OSD (On-Screen Display). There are control buttons located on the bottom right edge of the panel that comes in very handy for monitor calibration. However, the standard setting doesn’t have any problems with performance and image display. The AOC Flicker-free technology is enabled in the G2460PG. This is a feature that ensures no flickering and the regulation of brightness for comfort. The Kensington Security Lock is another feature included in the G2460PG that’s very useful and rare in monitors. Now that we have reviewed the technical specialties of the AOC G2460PG let’s deep dive in the advantages and drawbacks of this display. • The Gaming performance of this monitor is exceptional. With features like the G-Sync and the 144 Hz refresh rate, this is a great gaming utility. • The stand is very practical, and it offers a lot of adjustabilities. • The Input Lag is significantly low. • This is a no-frill monitor. • The Panel is a TN Panel and the Viewing angles provided are not too great. • There is only one Video input – the Display Port. There is no DVI/HDMI input available. • The Gamma on this display is not up-to the mark. • There is no wall-mounting capability. For example, VESA mounting is not enabled. • There is no audio support on the monitor. There is no audio jack or inbuilt speakers. The AOC G2460PG is priced at around $550, and depending where you make the purchase, there is a significant amount of variation in price. When it comes to medium-sized monitors with a TN Panel, the key to overcoming the limitations is by focusing on the overall monitor responsiveness. This includes implementing the G-Sync in ‘the right way’. In other words, numerous features need to be in perfect sync and the calibration of the display needs to be well-balanced. This is a monitor that is definitely one notch above many other and the reason is a great responsiveness – despite of it being a TN Panel. However, there are some limitations as one would expect from such a Panel, but on the Gaming front, the AOC G2460PG seems to hold the fort pretty well!